When Jeanne Sakamoto is not running an office with aplomb, she is a domestic goddess producing divine desserts from her kitchen. She is also kind. And kindly agreed to share her apple pie recipe with the Ninja Baker. Add salt to the flour. Cut in butter and Crisco until it is the size of small peas. Add enough ice water for the dough to hold together. Divide in half. Wrap in plastic and chill overnight. Roll out dough to desired thickness. Peel and slice apples in a large bowl. Toss with other ingredients. 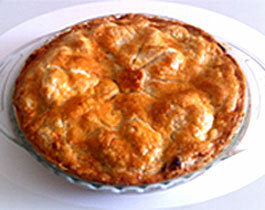 Pour apples into a prepared pie crust. Cut vents in the top crust for venting. Brush the top of the pie with beaten egg. Bake in a 400 degree oven for 50 to 60 minutes.